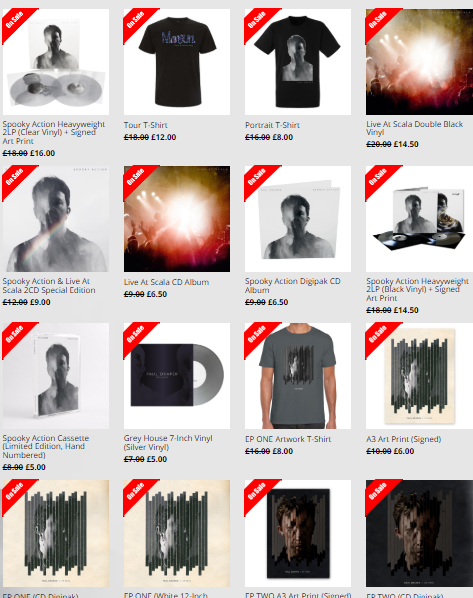 There are still good bargains to be had at the Official Store summer sale, but items are selling fast. The white vinyls of ‘Spooky Action’ have sold out but there are a few remaining clear vinyls available which come with an art print hand signed by Paul. ‘Live At The Scala’, the fantastic live gig recorded at Paul’s sell out debut solo London show on 21.09.17, has very limited copies left on vinyl and is also available on CD. There are just a handful of EP One and EP Two vinyls remaining featuring great quality b-sides, such as ‘The Silence Is Deafening’. You can find these and other great items such as tshirts and SIGNED art prints, at the Paul Draper store HERE .